I figured that Sesame Street artwork postcard deserved some Muppets in return, so this is what I sent in response. I love it too. I few years ago looked like to exist a fever about Muppets song here, everyone was singing it, well it isn't singable at all, it's more "tu tu tu-ru-ru tu-tu-ru-ru-ru" (: but it was fun. 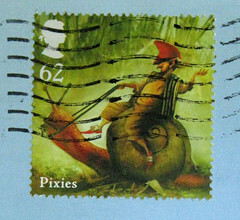 In return to your comments in my blog, first, yes recently some of my mail also got lost, I really hate to picture someone reading my letters, because believe some mailmen steal it. Recently in the news here in Portugal they showed a report of a mailman who stole 400 kg of mail (including personal mail, bills,..) just because he was working in two jobs and he couldn't have time to the mailman job, but he wanted to earn the money anyway. My brother who worked in the post-offices for some time told me that first advertising and business mail is delivered and only then personal mail. We all pay to post mail so they could be more careful at least, but I also know that some mailmen do a great job and they are very careful and friendly! gotta love them muppets !!! I so totally love the muppets. the king prawn and gonzo my favorite. This card is really cute =)! 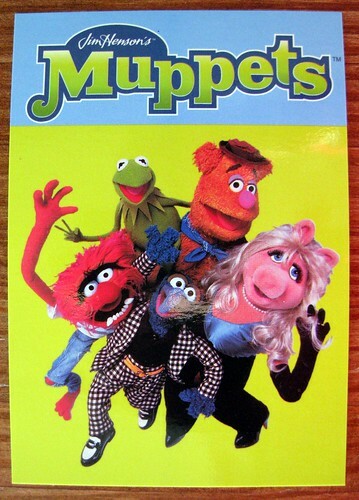 I don't like the muppets, but I like this card.